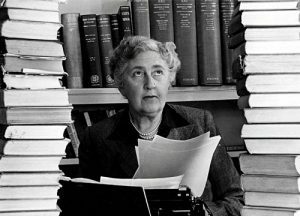 Agatha Christie, born September 15, 1890, was a best-selling writer, the best-selling novelist of all time, but she was also a surfer when young, a world traveler, a poison expert, and enthusiastic archaeology buff. Talent and imagination took her to the top, and her hospital pharmacy work in World Wars I and II gave her the poison know-how to dispatch 83 of her literary victims. When her first husband left her for another woman, she caused a mystery of her own by abandoning her car and disappearing for 11 days, leading some to speculate she’d done it either for publicity purposes or to worry the philandering jerk-husband. When she left England in 1928 on the Orient Express, she headed for Baghdad, stopping at the archaeological digs of some friends. She met Max Mallowan, a young archaeologist, and married him in 1930. She spent many happy years with him, roughing it on archaeological sites and gathering background for her stories and novels, including Murder in Mesopotamia and Death on the Nile. Check out her prolific collection of mystery fiction here, and the great movies inspired by the books.